This unique experience from the Upper to Lower Murray river awaits you via Paddlesteamers, spread across 2 states. Exclusive to Holidays of Australia and the World. Board the iconic flagship of Echuca aboard the PS Emmylou. Enjoy a leisurely roadtrip from Echuca to Mannum with an overnight in Mildura. Cruise down the Murray onboard the biggest Paddleboat in the Southern Hemisphere - the PS Murray Princess. Transfer from Melbourne to Echuca. 3 night Upper Murray Discovery Cruise aboard PS Emmylou including all on board meals. 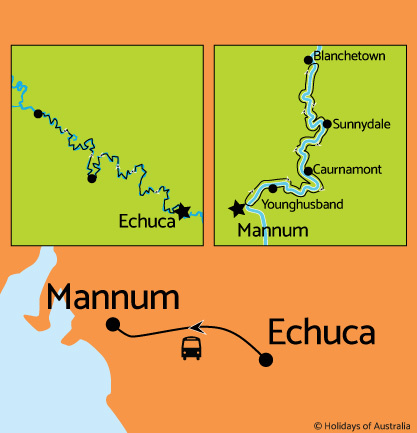 Transfer and sightseeing from Echuca to Mannum via Mildura. 3 night Murray Princess Discovery Cruise including all on board meals. Transfer from Mannum to Adelaide. *All departures subject to minimum numbers to guarantee transfers from Euchuca and Mildura.